First things first ... put the kettle on for an early morning cuppa! I then grab my camera and tripod and head out to catch the beautiful early morning light. 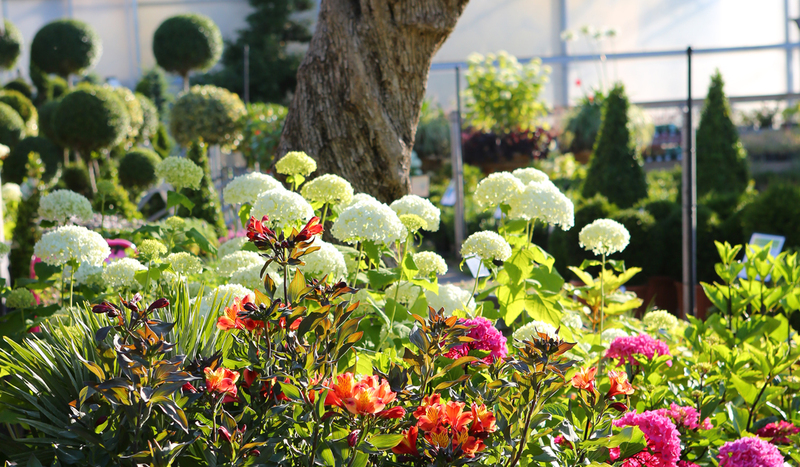 During the summer months the best part of the day at the nursery is first thing. It’s the golden hour, quiet and still and most importantly, very peaceful, there is no one else around. The sense of excitement and wonder as the sun's rays filter through brightly coloured flowers and foliage lift my spirits. Bees are flitting from plant to plant and goldfinches fly in and out of the wildflowers planted in the Show Garden at Clifton Nurseries Surrey. I walk slowly and thoughtfully so as not to disturb them. The first thing I spot as I step out into the cool still air is the warmth from the Alstroemeria with glimmering orange and yellow flowers and the Hydrangea ‘Annabelle’ with white blooms that glow like lanterns. They are spectacular placed beneath the gnarled and twisted trunk of an ancient olive tree. The camera is set to aperture priority f/-5.6 - this should give me enough depth of field for what I am trying to achieve. I want the subject to have good definition and the background to be slightly out of focus. 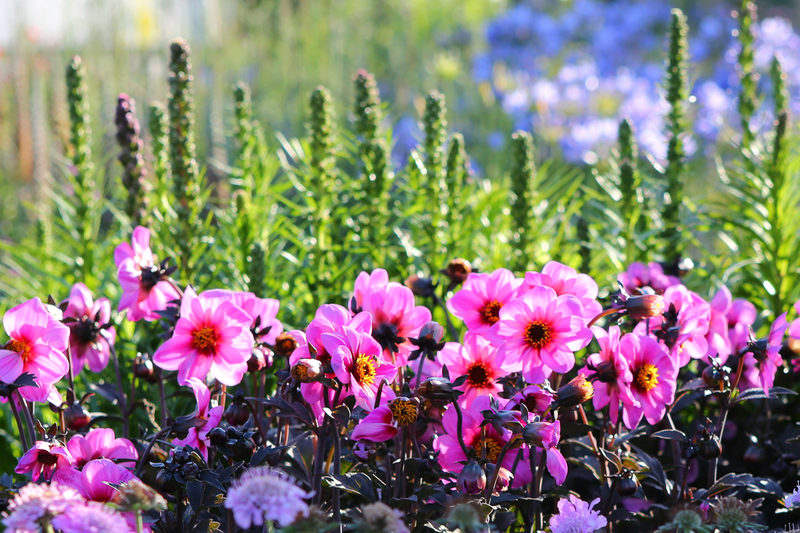 Bright pink Dahlias with deep black foliage are backlit by the early morning sun. This makes them an irresistible subject; I had better be quick before I miss my chance, the clouds are on the way. The deep blue Agapanthus in the background makes for a pleasing colour combination when combined with the Dahlias and the Scabious in the foreground. 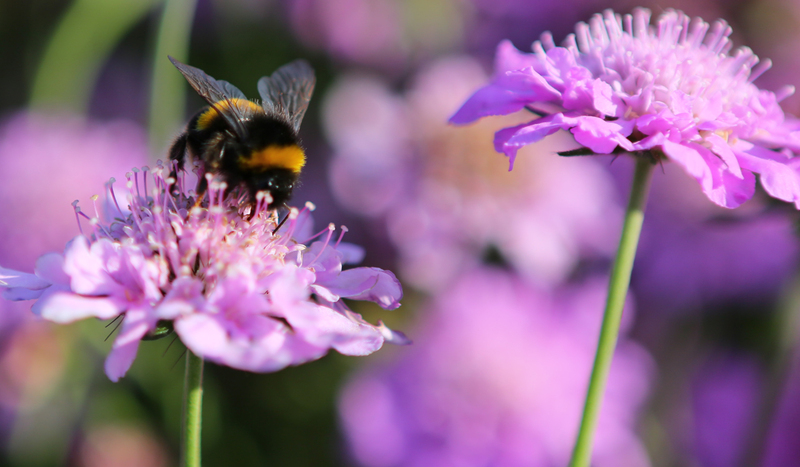 The bumblebees this year are amazing…. there are so many of them, especially in the nursery at the moment. They seem to love the Scabious and the Dahlias in particular. I am mesmerised by their ability to fly so adeptly when to me they look like they are not designed to do so! When you look at their wings they appear both fragile and strong. 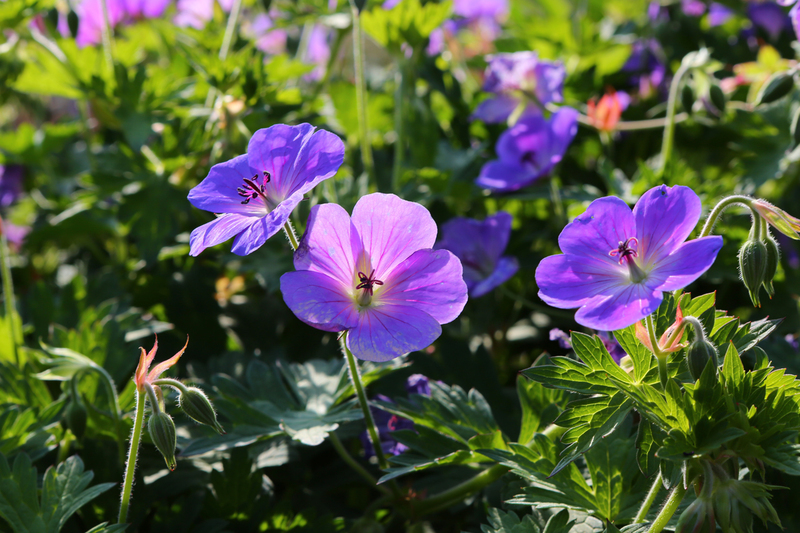 One of my favourite plants at the moment is Geranium ‘Rozanne’ – I am not the only one to like this plant. It has been announced RHS Plant of the Centenary and rightly so. It flowers non-stop throughout June and into late September. Its lovely violet-blue flowers are a picture this morning – worth getting out of bed for and perfect for attracting bees and butterflies. I can start to see cars pulling into the nursery car park. My quiet time is nearly over and the working day will be soon be upon us. I make the most of my last few moments alone by heading towards the Show Garden again to take some shots of the sunlight dancing on the water bowls. The reflections of Gaura lindheimeri, Stipa tenuissima and Verbena bonariensis epitomise the tranquillity of my early morning photo shoot. Verbena flowers are floating randomly by the edge of one of the pools, placed by nature and of course encouraged by a stunning planting combination designed by one of our in-house garden designers, Ben Lowry. Trained at Kew, Jono enjoys combining his interest and expertise in both horticulture and photography. Many of the images on this website were created by Jono.